Indepen-dance 4 is bringing its award-winning show for 3-5 year-olds, Four go Wild in Wellies, to Aberdeen’s Music Hall on Saturday, February 9, and Sunday, February 10. Featuring bobble hats, scarves, tents that have a life of their own and, of course, lots of fun in wellies, Four Go Wild in Wellies is a playful look at the joy of inventiveness and curiosity; the negotiation of social structures; how friendships are built, broken and mended; the spectrum between collaboration and competition; play that emerges from interaction with each other and with the world around including, particularly, the natural world. The show has been created with the company by director Anna Newell, award-winning composer David Goodall and choreographer Stevie Prickett, a team who have worked together for more than 20 years creating work for younger audiences. Indepen- dance 4 are gaining a reputation for innovative and high quality touring productions. 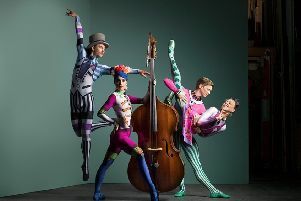 Its four dancers – Hayley Earlam, Emma Smith, Neil Price and Adam Sloan – have worked with some of the UK’s leading choreographers and musicians over a number of years. Tickets are available online at Aberdeen Performing Arts or call (01224) 641122.